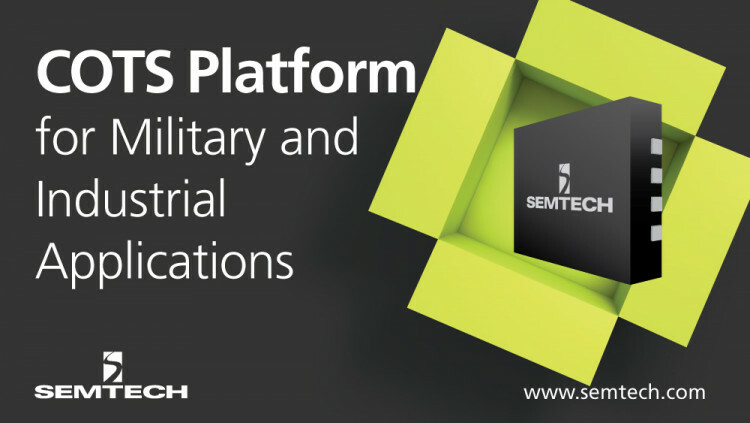 Semtech Corporation (Nasdaq: SMTC), a leading supplier of high-performance analog and mixed-signal semiconductors and advanced algorithms, announced the addition of a commercial off-the-shelf platform to its High-Reliability Products Group that is targeted at military and industrial applications. Semtech’s new additions to its High-Reliability Products group are COTS Power and COTS Diodes. COTS Power devices are industrial grade power management products with a military operating temperature range of at least -55C to +125C. Offerings include select power management devices, including DCDC regulators (buck and boost), LDOs, shunt references, synchronous FET controllers and Neo-Iso™ solid-state relay devices. COTS Diodes offer extended temperature range capability where more expensive QPL devices are not required by the application. COTS Power and COTS Diodes are available are available for sampling and EVBs are available for Power product orders. For additional information, visit www.semtech.com/info. Semtech’s COTS products are extended temperature range (at least -55C to +125C operating junction temperature) commercial grade products. Offerings include discrete rectifier and Zener diodes as well as select power management devices, including DCDC regulators, LDOs, references and Neo-Iso™ solid state relay devices. With the available product range increasing regularly, these products are ideal for aviation, military and industrial applications. For more information, visit www.semtech.com/high-reliability-discrete-semiconductors. All statements contained herein that are not statements of historical fact, including statements that use the words “designed to,” “ideal for,” or other similar words or expressions, that describe Semtech Corporation’s or its management’s future plans, objectives or goals are “forward-looking statements” and are made pursuant to the Safe-Harbor provisions of the Private Securities Litigation Reform Act of 1995, as amended. Such forward-looking statements involve known and unknown risks, uncertainties and other factors that could cause the actual results of Semtech Corporation to be materially different from the historical results and/or from any future results or outcomes expressed or implied by such forward-looking statements. Such factors are further addressed in Semtech Corporation’s annual and quarterly reports, and in other documents or reports, filed with the Securities and Exchange Commission (www.sec.gov) including, without limitation, information under the captions “Management’s Discussion and Analysis of Financial Condition and Results of Operations” and “Risk Factors.” Semtech Corporation assumes no obligation to update any forward-looking statements in order to reflect events or circumstances that may arise after the date of this release, except as required by law. Semtech and the Semtech logo are registered trademarks or service marks, and Neo-Iso is a trademark or service mark, of Semtech Corporation or its affiliates.